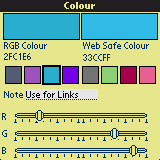 NineColours is a helper application for choosing web page colours. Colours may be mixed by adjusting the colour sliders or by picking a starting colour from a colour palette. The display shows the colour as a 16 bit colour and as an 8 bit "websafe" colour. For each colour in the colour list a short note can be attached to remind you what intend to use the colour for. NineColours can also be used as a colour notebook if you are choosing paint or other colour items. NineColours was originally designed to help choose colors on a webpage. In the classroom, it can be used to help study the mixing of colors. Once you have choosen your colours the information can be exported as an HTML formatted memo. Just do a hotsync and paste the memo into a document and then display it as a web page. An example of a Colour chart memo exported from NineColours is shown below.